How do you keep them distracted when you are trying to make a point? You know they need the learning experience. So where do you get the media to distract them while you get your point across? All during my career in the military and manufacturing I would recognize characters in the morning comics. That’s right, the morning comics—the Funny Papers. I had several favorites: Beetle Bailey, BC, Boris & Natasha, Hagar the Horrible, Wizard of Id. Of course, while in the Army it was Beetle Bailey, but even until this day, I see someone there that I just know I know. After the Army, along came Dilbert and many of my civilian counterparts started to show their face. And while we’re at it, wasn’t Camp Swampy a great place to work? Zero stress, you might remember. No chance of getting burned out there. I found less people I knew in BC, the Wizard and Hagar; but once in a while, there they were jumping right off the page reminding me of something that had recently taken place at work. I used several comic clips as I wrote my Book “There’s a Moose in the Guard Shack” as reminders of the real action that had actually taken place when the adventures actually happened. Then as the years rumbled past, I discovered the Far Side. No longer did I recognize the players as people I had known before. No, I’d never met these guys before. But something in the puzzle that Gary Larson laid out often struck me as familiar. I could see the players as my compatriots and a familiar situation that had recently confounded the group. At one particular organization I worked with in the early 90s, this held very true. Every day, there was another cartoon that fit the bill. I could use this, and I did. As an early-to-work-guy, I found the time to prepare the day’s thought after my arrival. I cut the cartoon from the morning Dallas Times Herald (and later the Dallas Morning News after the Times-Herald folded), got my handy-dandy bottle of white-out from my desk drawer and began to alter the caption. With a couple of trips back and forth to the copy machine, I was ready to finalize my masterpiece. I put together my morning epistle for the manager’s meeting training session, an event that started at 0900 hours and depending on the principle running the show, lasting sometimes till what often seemed like dark! This was usually the case when the Group Vice president Pat B. decided to join the harang. There was a great deal of stress on the managers and supervisors; they all had been with the organization for some time and I was the new guy, brought in to train and develop them to become experts in a new manufacturing software system. Pat B. was a great injector stress. The guys saw no real need for change, they had zero buy-in with what the numbers said daily or ever for that matter—the problem had always been somebody else’s problem. For the first week or so, I just added the altered Far Side cartoon to the back of the morning’s training issue. For a while that worked. I would train, they would pay attention (& learn—well, most of them anyway), and then we would arrive at the Far Side comment on the current situation. Woops, there’s a fly in the ointment! Things began to change quickly. I noticed it right away and had to change my methods. As I would get up front to do my morning training and passed the training packets down each side of the conference room table, I began to notice the shuffling of the packets; well not really shuffling. All they had to do was to turn the packet over and right there on the last sheet was the cartoon. They were looking for the Far Side cartoon to see what the morning laugh was going to be. I had lost them! I had to change up my tactics and do so quickly. It took some time to gather them back into the fold and get on with the training. My first thought was to place the Far Side page at different places in the training package. Well, I know you understand the principle of trial and error. Well, this was a big error, to say the least. They all spent whatever time it required to find the cartoon and then show their neighbor on each side and across the table that they had found theirs and compare with each other to insure that they all had the same edition. That didn’t work, obviously. I was pretty much stumped at that point. I had to have the cartoon or they’d spend the entire time discussing why I didn’t. I had painted myself into a corner. That Group VP, Pat B., had just arrived back from a visit to some of our suppliers in Japan and had advised the management team that he was considering converting some of our practices to what the Japanese did as routine. He thought this would improve efficiency and productivity. He mentioned a few of his ideas and solicited the thoughts around the room. As the New Guy, I pretty much kept quiet and let the others have their say. One of Pat’s ideas was to outfit the entire plant, some 600+ personnel, in smocks. The idea was to lessen the perceived differences between the hierarchies of the staff—make everybody feel as though they were just as an important part of the team as anybody else. The principle was thoughtful. At this time smocks were available to everybody within the plant except the temporaries—not a large contingent. Some of those in positions that were required to accomplish a fair amount of material movement wore smocks as a matter of course, but not full time. Because we already had smocks, Pat’s idea was to just increase the current provider’s contract and make the T@&%y Blue color available to everybody. Pat subscribed to the theory of management by walking around (MBWA) and he had obviously done his work by canvasing some of the workforce about how they felt prior to announcing his idea to the staff. Because the Manager’s Meetings usually ran much longer than they should have, I tried to keep my training to a 15 minute block and no longer. (Get a thorough understanding of how I feel about this topic from my book “There’s a Moose in the Guard Shack”, see the chapter on Mess Hall Cups) From that day forward running almost a week, the meeting would take several tangents from the selected material—usually to discuss smocks. I could see the writing on the wall. This was a much bigger topic than just decreeing that everybody wear smocks. There was more behind the rumblings than just the perception of unity. My theme for the next week was in the vane of: “Your smock’s blue. Mine is too!” I began to find the altered cartoons hanging at a boo-koo of work stations all over the plant. The managers and supervisors had not kept them to themselves; they’d made copies and distributed them everywhere. 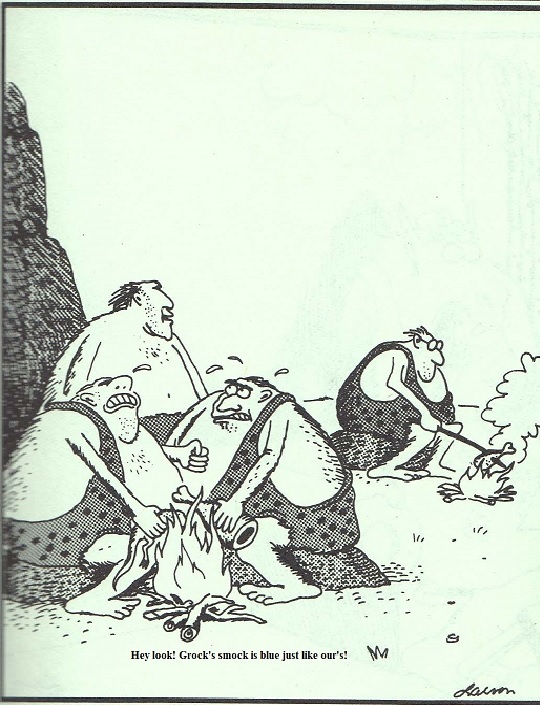 A great deal of those I used showed several cave men wearing leopard skins sitting around the fire pit conversing with one another—Gary Larson used many fire side meetings to comment on society. The caption I changed to: “Hey look! Grock’s smock is blue just like our’s! !”—complete with the original misspelling. I never ask Pat if he had noticed them, but it quickly became obvious that he was getting feedback on this issue. As I was free to walk the entire plant floor, including the warehouse, shipping and receiving dock, and all the offices; I was being asked routinely if a final decision had been made. Several days into the ruckus, I had an idea that I thought would relieve the tension just a bit. I obtained a medium sized smock—far too small for me, but just right for Let, our oriental data entry clerk and actually way too big for her—and talked my wife into using her sewing abilities to help me out. I rummaged around and found a plethora of badges, ribbons, a tags, and medals from my Army days and Patsy sewed them up one sleeve, down the other, and all over both sides of the chest area. It looked as official as a dress blue smock ever could. The very next morning after the Manager’s Meeting had concluded and I had presented the training session, I ask everyone to hang on for just a minute. I had previously insured that both Frank (Plant Manager) and our guy Pat B. were both in attendance. I turned to the door and signaled my support team to enter. Jim, our PC Specialist (our cameraman for the morning) came in and took up a position first, raising his video camera and awaited the rest. Let strode in wearing her dress blue smock and took up a position squarely in front, followed closely behind by Warren, our Printer Boy for lack of a better title. Warren was armed with the GI Standard Issue Pointer. After the room decibel level lowered to a dull roar, I started my briefing as Jim filmed, Let Vanna Whited as best she could, and Warren squarely pointed to what I discussed and where I indicated. Each description of the indicated badge, medal or service stripe was followed by a resounding guffaw and complete understanding of the award and//or problem resolved. The badges were awarded for such accomplishments as (1) pulling an overnighter to discuss supplies with overseas vendors in China or Japan (2) most PC board mistakes from sister company repaired in a 6 hour period (3) most number of times promoted into a new Title with larger responsibilities without a pay raise granted…on and on I went. I tried to capture every feeling associated with each member of the conversion team that they had advised me of over the preceding weeks. They had complaints, mostly minor, but complaints just the same. They really just wanted somebody to listen to them. Pat made his decision that same afternoon. No smocks plant wide. The company would still supply them to those that wanted the extra protection when they needed it. The main concern that management had overlooked was the fact that the workforce was primarily women of the ages 18 through 35 (almost 75% as a matter of fact). The work was not hard and the majority of the women were seated during most of their shift. While a great deal of them wore jeans to work, they ALL tended to dress up on Friday, not really elaborate mind you, but dress up they did. They were afraid that the smock rule was going to take away their ability to show off for their fellow workers—an ability they did not want to lose to the smock rule. The smock had actually lost out to one of the very social identities it was intended to overcome. While I had made this very point during the dress blue smock briefing, I was not the straw that broke the camel’s back. Pat had received feedback in the same vain from all corners of the plant. When he discovered that his managers and supervisors were just as much against the idea as the greater number of his workers were, he came to the appropriate (and popular) decision that smocks weren’t to be the uniform of the day. I kept all those cartoons but could find only the one when I came to look for them.